12 year-old Ries Viverette wrapped up the prestigious Rotax BNL karting championship last weekend in Genk, winning the championship on a high note with a weekend victory. 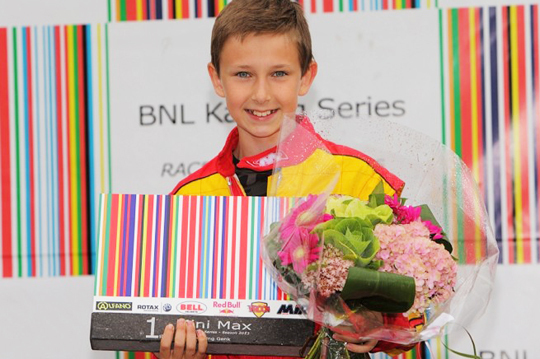 In the minimax class (10-13 years) he was in front all season, with several victories and many podiums as a result. The battle with his rivals was fierce, but Ries always stayed in control and never caved in to pressure. For 5 years Ries has been part of the GKS kart team, run by Paul and Koen Lemmens. Under their guidance Jenson Button (McLaren), Jerome D’ambrosio (Lotus) and Robin Frijns (Sauber) have all honed their craft. The team has won numerous world and European titles. The Rotax BNL championship is a RACB sanctioned competition, and the winners exclusively hold the title of Belgian kart champion. Ries is already looking forward to taking the next step up to the faster 13-15 year old categories.